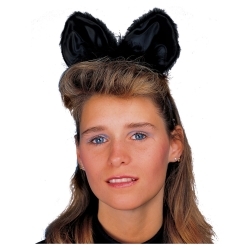 These cat ears are perfect for creating a quick and easy cat costume. Ears are made of black fur with satin lining attached to a marabou trimmed headband with elastic chin strap for a snug and secure fit to almost any size head. Don’t forget to check out the rest of or cat costume accessories to create your own customized cat costume!